This article is largely based on research by Michele Wyman, an administrator of the Omaha History Club. Thanks for sharing it Michele! When Fort Omaha was designed and built, it was on the bottom of a hill covered with a grassy plain three and a half miles north of Omaha. In this place, more than two dozen buildings rose up in the late 1860s, after the Civil War. Each of these buildings was made of wood though, adding a sense of impermanence to the fort. Sure, they housed soldiers and officers, important supplies and the weapons of war. But one prairie fire or wild tornado would wipe them all out in a fell swoop. When he took command of Fort Omaha in 1879, General George Crook had several new brick buildings erected. One of the most important development projects he pushed was rebuilding Officer’s Row from being a collection of single-occupant and duplex wood frame houses to become brick-clad, permanent structures. Some of those, including the Crook House, are still standing today. However, in order to build new ones, these the old houses had to come down. Enter brothers William and Oliver Grenville. A circa 1885 diagram of Fort Omaha showing Building 15 on officer’s row. Image from the US Library of Congress courtesy of Patrick Thompson. Built in 1869, Building 15 was originally located on Officer’s Row in Fort Omaha. That means that as of 2017, it is 127-years-old, making it one of the oldest standing houses in North Omaha. According to extensive research by Omaha History Club administrator and historian Michele Wyman, I have decided that this building almost certainly became 6327 Florence Boulevard. A circa 1875 drawing of Fort Omaha featuring the wooden buildings, and the hospital in the northwest (upper right) corner. Standing two stories tall, Building 15 was located two doors south of the General Crook House. It was likely a single family home with five bedrooms, a living room, kitchen, parlor and porch. There was a small coal house located behind the building. Built of wood on the barren plains north of Omaha City, it didn’t fair well over its early lifetime, and in 1896 it was described as being in “very bad condition” in letter from the Chief Quarter Master of the Department of the Platte. The walls in the house were reportedly 14″ thick, and the floors were 2.5″ thick. Ceilings throughout the house are 11′ tall. Sold at auction by the US Army in 1899, the building was made derelict by brick construction ordered by General Crook 20 years earlier, and as surplus, the old wood houses at the fort were slated for removal. This is the Living room at 6327 Florence Boulevard as it appeared in 1983. Building 15 was 31-years old when the eccentric bachelor brothers William and Oliver Grenville bought the house. William was born in 1860 and his brother in 1862, both in rural Wisconsin. After more than a decade as farmers in rural Nebraska, they went into business running a greenhouse and orchards, first in East Omaha and later along Florence Boulevard. According to US Census finds by Michele, the Grenville Brothers lived at North 9th and Jaynes Street in the Sherman neighborhood in the 1890s. They were at 6201 Florence Boulevard in for the 1901 census, and by 1902 there were at 6223 Florence Boulevard. This is a 1983 pic of the Fort Omaha House at 6327 Florence Blvd. In 1900, the brothers bought Building 15 at auction and moved it to their property along Florence Boulevard. Originally located across the street from their commercial greenhouses, the home has stood at 6327 Florence Boulevard since it was moved. It was situated on 2.5 acres when it was first moved, and today it has 2,550 square feet in the house with five bedrooms with 1.25 acres of land surrounding it on the east side of the boulevard. There’s also a 125-year-old barn down the cliff behind the house. The Grenville Brothers reportedly owned the land from the Florence Boulevard east to the Missouri River. It was December 1899 when the Grenville brothers bought the house for $160. According to Michele’s research, more than a dozen other buildings were sold at the same time, and I suspect they’ve faded into Omaha’s neighborhoods too, and may still be there too. However, it’s the Grenville brothers’ house that kept getting attention for almost a century after it was built. There was a newspaper account of the day the building was moved from Fort Omaha to its current location in 2 pieces. This is a headline from the November 3 1935 Omaha World Herald about the Grenville Brothers 1908 Stanley Steamer car. The house served the brothers well for several decades, even reportedly hosting a moonshine operation during the Prohibition era. However, when Oliver married, the brothers had a falling out that drove William to move into the basement. That situation stayed intact until the brothers died. As a side note, an interesting 1944 Omaha World-Herald article highlighted the Grenville Brothers’ ownership of a Stanley steamer roadster, a rare steam-driven car in an era when almost all cars were gas-powered. That same year, Oliver Grenville platted part of the family land between Florence Boulevard and North 24th Street for development. That was the former site of the greenhouses, and now they were gone. Houses were built there soon after. William died in 1943; Oliver died in 1946. The Grenville family plot is located in Forest Lawn’s section 10, lot 279. Both brothers are buried there, along with several other family members. The house stayed in the Grenville family until 1951, and there were three other owners until 1983. It was 1983 when Mr. and Mrs. Tony Mueller finished buying “the Fort Omaha House” at 6327 Florence Boulevard. In Michele’s research, she found an extensive 1983 Omaha World-Herald article featuring the family’s restoration work on the house. It reported that the Mueller’s restored and refurbished the first floor of the house and much of second. They repaired the original plaster walls through the house, installed wallboard and wainscoting where historically accurate, and replaced historically inaccurate cabinets. Focusing on the floors throughout the home, the Muellers removed misplaced linoleum; then removed tar and paint from the original pine floors on both stories of the house and refinished them. Afterwards, they installed new appliances and fixtures throughout the house. Today, the fireplace and mantle are original to to the house. Bathroom fixtures added were after house was moved, and they remained during the Mueller’s renovations. The tin ceilings in the house were salvaged from Orchard and Wilhelm Company building at 16th and Howard in the Old Market before it was razed. The columns and woodwork within and outside of the house were salvaged from other homes in North Omaha. As of the 1980s, the house was still heated with steam radiators, and only master bedroom was air-conditioned. This is the extent of the property at 6327 Florence Blvd. Note it includes the cliff behind the house and the bottom land next to the railroad. Today, the house is owned by Mary Buckwalter, who bought it in 2012. My own research shows the house is probably a rental property, and from a visual scan of the property, the house isn’t in great conditions. Its historical veracity hasn’t been acknowledged by the City of Omaha’s Landmark Heritage Preservation Commission, the Nebraska State Historical Society or even Metro Community College, which is housed at Fort Omaha. Hopefully it can be recognized for its historical significance by becoming an official Omaha Landmark, and be restored again to its full historical beauty. The Fort Omaha House is one of the oldest houses in Omaha, and surely deserves respect for its historical provenance. Fort Omaha helped establish the City of Omaha as essential to the development of the American West, and the Fort Omaha House has one of the most direct connections to that development today. 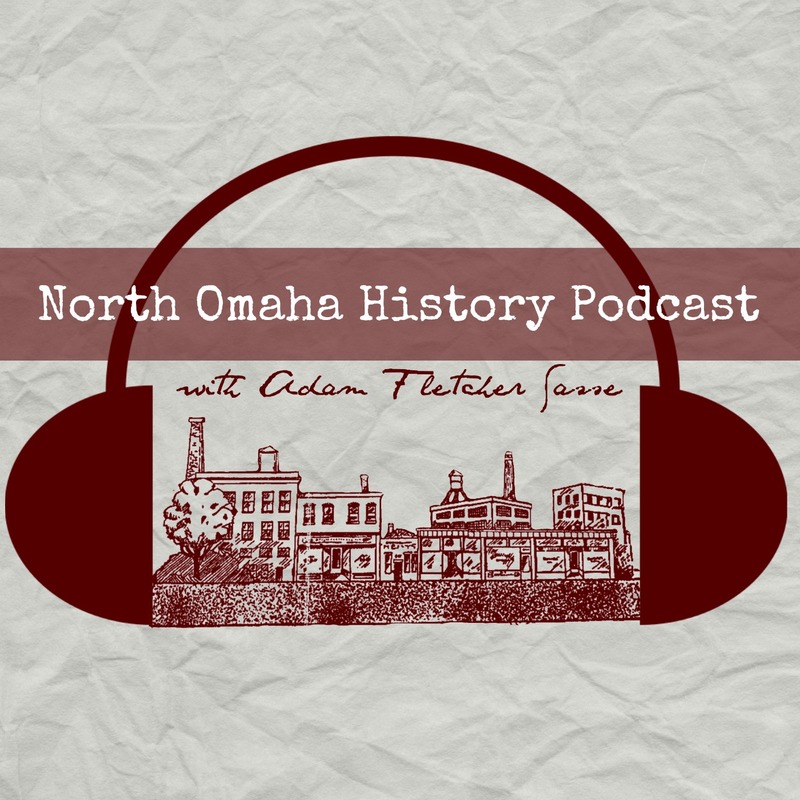 CLICK HERE to order North Omaha History Volume Two by Adam Fletcher Sasse!